This week the news finally broke out of Japan that the long-awaited second season of the smash-hit anime Attack On Titan will begin airing in Japan starting in April 2017. Following this news, comes the announcement that US distributor Funimation (who released the original series in the US and Canada) have picked up the rights to the new season. 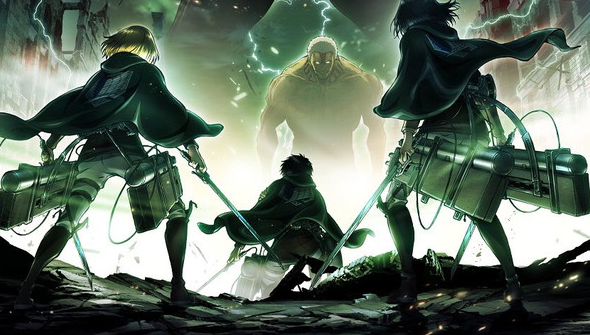 In case you've been living under a rock, Attack On Titan is one of the breakout hits in anime and manga of recent years, proving to be one of the few genuine cross-over hits that is just as popular with people outside the usual anime circles. Set in a world where what's left of humanity lives in walled cities to take refuge from the man-eating Titans who walk the earth, the original 25 episode season aired way back in 2013. In the time since it has been off the air, the manga has been a consistent worldwide best-seller, with an impressive 70 million copies in print, and has spawned spin-offs, videogames and a two-part live-action movie series. The announcement doesn't contain a lot of new information but states that the series will come to the FunimationNow streaming service in the US and Canada. In the light of the new partnership between Funimation and Crunchyroll, it seems likely that FunimationNow won't be the only place you will be able to find the new episodes. With Funimation's streaming service switching its focus to dubbed content it's not clear if they will be simulcasting the show as it airs in Japan, or if they will be waiting and releasing the episodes dubbed later. The original season also aired on Adult Swim's Toonami block- so could the new season make its way to TV in the States sooner rather than later? We're also waiting to hear where fans outside of North America will get their chance to see it. With this and the Dragon Ball Super news in less than a week, US-based anime fans must think Christmas has come early.